Lots of real world things to be scared of. I'm getting ready to start a new week. The last of October 2018. 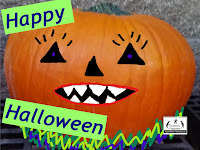 Halloween will be on Wednesday, and there are plenty of things to scare me. It looks like Brazil has just elected an ultra right wing president and many of us are morning the massacre of innocent people at a Synagogue in Pittsburgh. While we're hopeful that next week's US midterm elections will bring control of the US House back to Democrats and Progressives, that's no guarantee that any of the terrible things happening in the US and the world will change. I just read two articles that add to my sense of despair. One article shows how right wing political movements and ideologies have grown around the world, fueled by social media and uses of the Internet. A second article digs into the Wikipedia world and find a lot of things that stink. Here's a cMap where I point to many more issues that concern me. 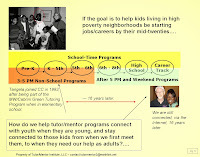 It's in the context of thinking of the long-term impact resulting from how we're electing right-wing leaders in the US and throughout the world that I re-examine my own long term efforts to help well-organized, volunteer-based, non-school tutor and/or mentor programs grow in high poverty areas of Chicago, where adults connect with youth when they are as young as elementary school, then stay connected through high school, and into adult lives. That's what the graphic at the right visualizes. The kids in the upper left were in 7th and 8th grade when this photo was taken in the mid 1990s. I'm pictured at the right in late 2000s photo when one of these kids came back to talk at the annual year end dinner. It's 2018. We're still connected on Facebook. That's what I mean by "long-term". Below is a page from the February-March issue of the printed newsletter that I was able to mail to about 10,000 people from 1994-2002. Email and web sites took the place of this as I ran out of money to continue the printed newsletter. 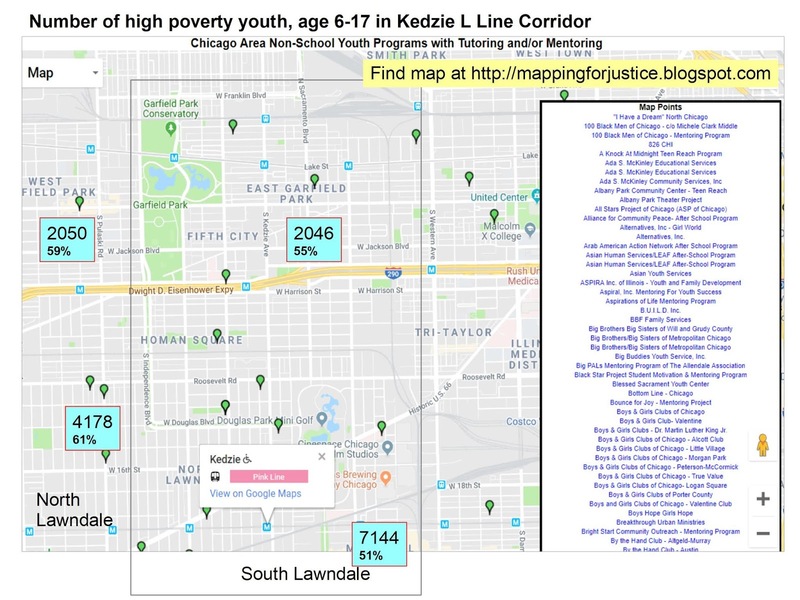 This article includes a map of Chicago, showing high poverty areas where organized tutor/mentor programs are most needed, as a way to expand the social capital, or network of people and experiences, for kids who have a limited based of work and career models, and people opening doors to opportunity, in their lives. Here's a graphic that communicates the same idea. 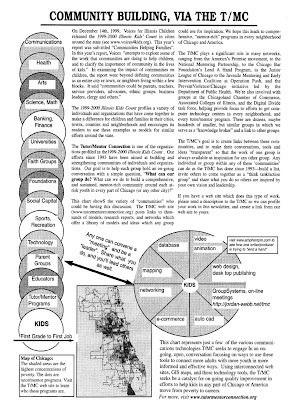 On both graphics the large circle represents the information library that I have been building since I started leading a single tutor/mentor program in Chicago in 1975. The circle also represents a meeting place, or community of people, who gather on a regular basis, like people in faith groups do, and people in classrooms do, to learn from a central library information and ideas, and to innovate ways they could help tutor/mentor programs grow in different parts of the city and suburbs. 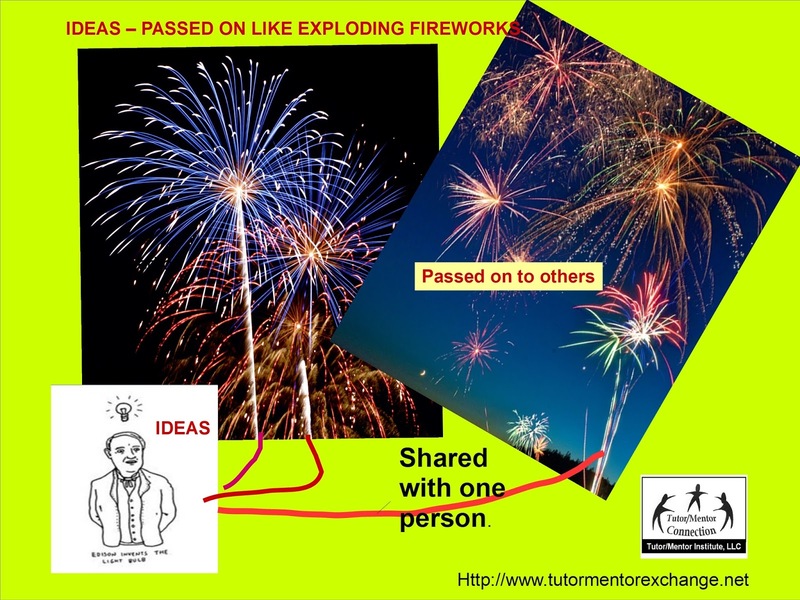 I took this to another level when starting the Tutor/Mentor Connection in 1993. In my 1973-1990 retail advertising career at Montgomery Ward's corporate headquarters in Chicago we supported 400 stores in 40 US states, through the work of various central office teams. They could do that because they knew where existing stores were located, and where there were potential customers for new stores. By building a library of information, and a directory of existing tutor/mentor programs, my goal was that people in these learning and planning groups would begin to think of ways they could help all youth tutor/mentor programs within a geographic area get the ideas, dollars, talent, technology and other things each program needs to be great at what they do. My success over the past 20 years has been hindered by disasters like Montgomery Ward, our main sponsor, going out of business in 2000, and by the 9/11 terror attack, the following wars, natural disasters, then the financial melt-down of 2008. However, I also was never able to get consistent, in-depth, support from Mayor Daley, major foundations, or other civic leaders. I had one business person visit my office in the 1990s and after I walked him through the strategy he said "I love what you're doing, but I'll never support you....because I want to start my own thing." 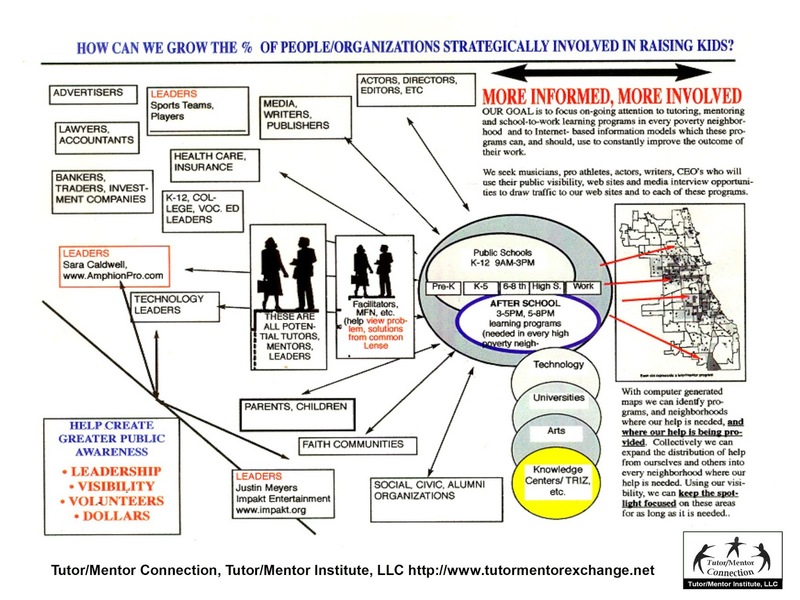 Since 2011 I've not had an organizational structure to help me continue the Tutor/Mentor Connection. I created the Tutor/Mentor Institute, LLC with the hope that I could generate revenue through consulting or by finding partners to invest in this strategy. That has not happened. As I write this I'm wondering where the money will come from to keep my bills paid for the rest of this year...and into 2019. Yet the need for non-school youth serving organizations reaching k-12 youth in high poverty areas is as great today as it was in 1993. That brings me back to the start of this article. Kids entering school today will take 12 years to finish high school and another four to eight years to be starting stable jobs and careers. What will the world look like in 20 years? Will people of color, people of different faiths or different gender identities, or who are fleeing conflict in their own countries, be seeking a refuge from the terror in America by then? Or will we have gone through a third World War, fueled by nationalist leaders in different countries? Will there have been civil wars within the US and other countries, pitting extremist ideologies against each other? While my local focus has been to help youth tutor/mentor programs grow in Chicago neighborhoods, the process I've piloted is knowledge-based problem solving. If someone aggregates information about a problem others can use that information to innovate solutions. With this in mind I've begun to expand the knowledge base I host, pointing to articles about social justice, inequality, poverty, etc. I also point to articles about the climate crisis and about some of the political issues that I feel need to be better understood by more people. To help people navigate the information I've been collecting, I created this article, which has a list of links to various sections of my web library. Using this, anyone can start to do their own learning, and can begin to form a circle of friends, family, co-workers and faith group, who dig deeper into this information and try to create a different future than the one we seem to speeding into. Is it enough? 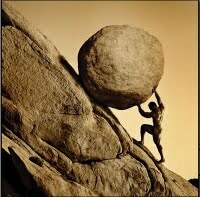 I feel that I'm pushing a huge rock up a steep mountain, with too little help, and too many other issues competing for attention. With the growth of right wing governments I fear the mountain itself will collapse, and what we do to build systems of support for disadvantaged youth will have no benefit. Or, will this be the only thing that matters? Even if the entire world is in flames, our will to survive will continue to burn brightly, and our need to provide systems of support for our kids, and each other, will still be with us. If you can help me keep this information resource available, visit my FundMe page. While I seek help, I also seek partners or a way to make the resources and ideas I've aggregated since 1993 a part of the work others are doing. Visit this article describing "a bold experiment called MITx U.Lab" and compare what they are describing to what I've described in this and other articles on this blog. 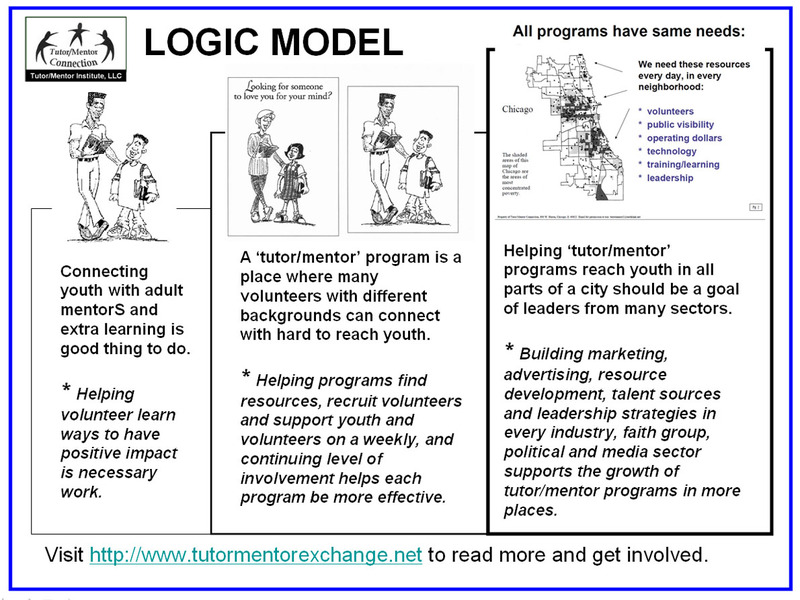 How can I get this group to adopt the Tutor/Mentor Institute, LLC as one of its focus areas? 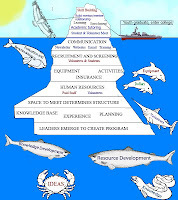 I use graphics to communicate ideas and to highlight web sites or articles I've been looking at. I thought I'd share some of these today to show what I've been looking at recently. Last week I attended a Chicago Ideas Week event titled "2 Milles. 16 Years: Chicago's Death Gap" , that focused on health disparities in different neighborhoods of Chicago. See my follow up article at this link. 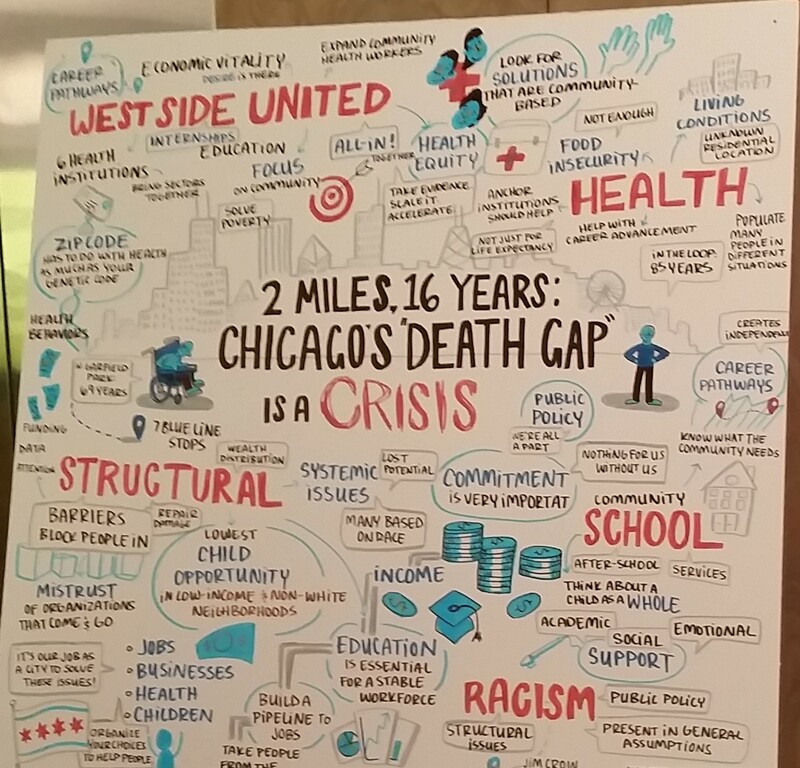 During several of the Chicago Ideas events a graphic designer was chronicling the conversation. This shows the topics discussed in that event. 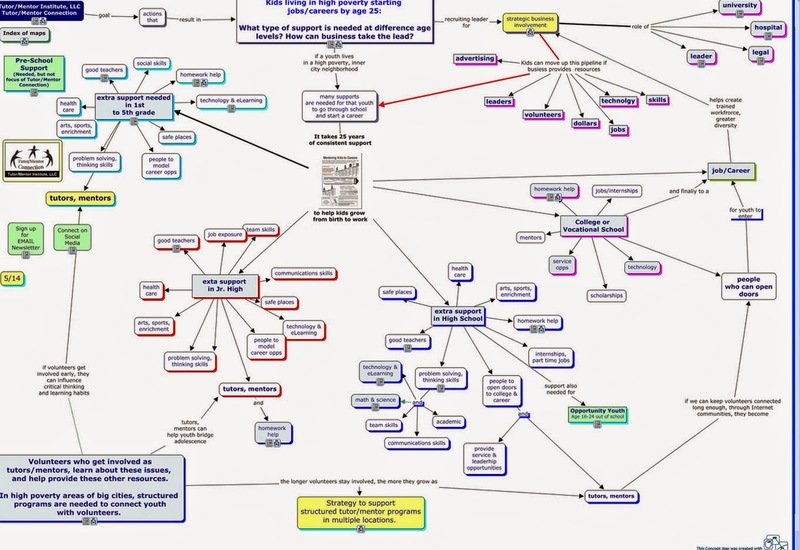 As you look at this graphic, I encourage you to view this 'race-poverty' concept map. 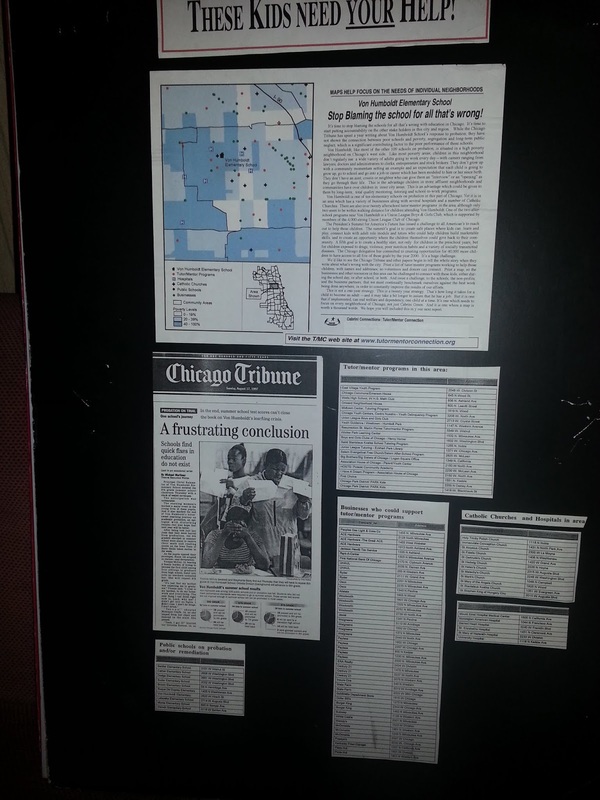 It shows the range of issues affecting people in high poverty areas of Chicago and other cities. During the Chicago Ideas Week presentation one panel member listed three needs of the community. Jobs was number one. Programs that provide hope and opportunity for youth was number three. Later I found this article talking about "The Limits of Job Creation". I highlighted a concluding section where the writer talked about the importance of creating networks of support for youth. 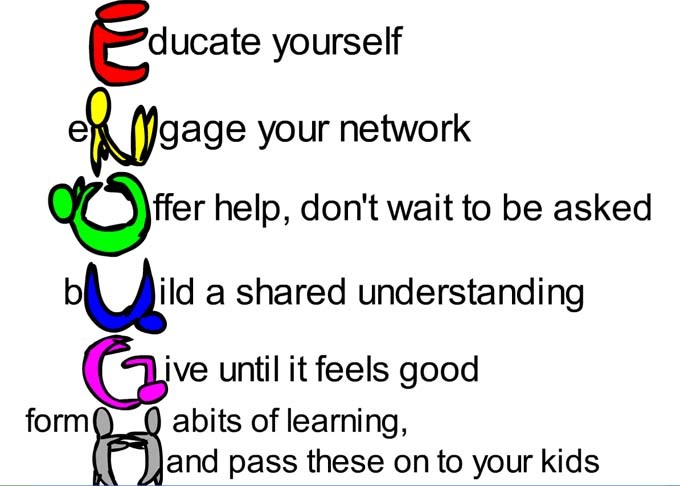 This is what I feel well organized, volunteer-based tutor/mentor programs offer. Here's another graphic from my library. I included this in an article I wrote a few weeks ago, titled "Never Forget". 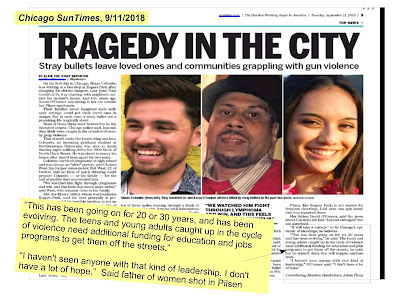 In this article a parent of one of the slain young people shares his fear that nothing will change because of a lack of leadership and public will. The problems of Chicago are problems of people in other places. Thus, solutions, and supporters, can come from any part of the world. The Internet makes this possible. It's why I have spent so much time on-line since the late 1990s. 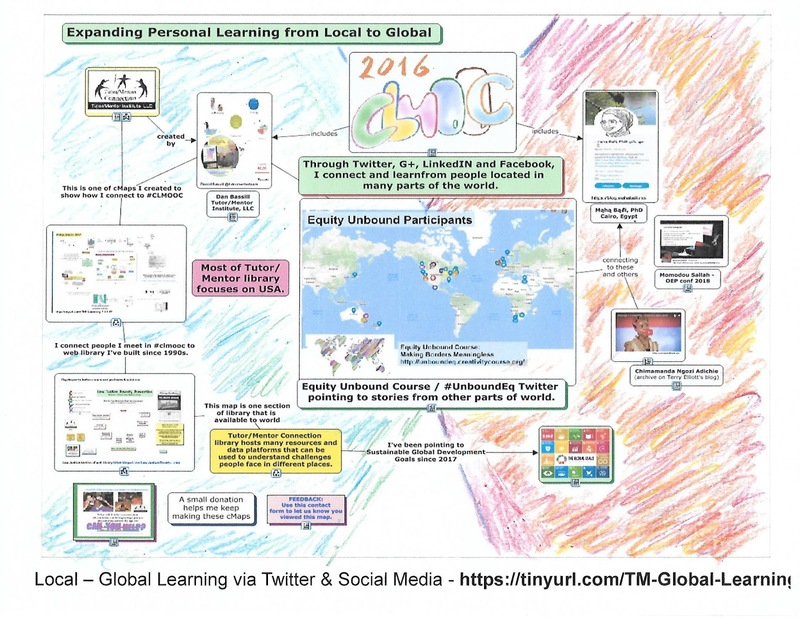 I created this graphic recently to visualize the way I've been connecting with people and ideas from around the world, via on-line events like Equity Unbound, which is an event hosted on Twitter and other platforms. 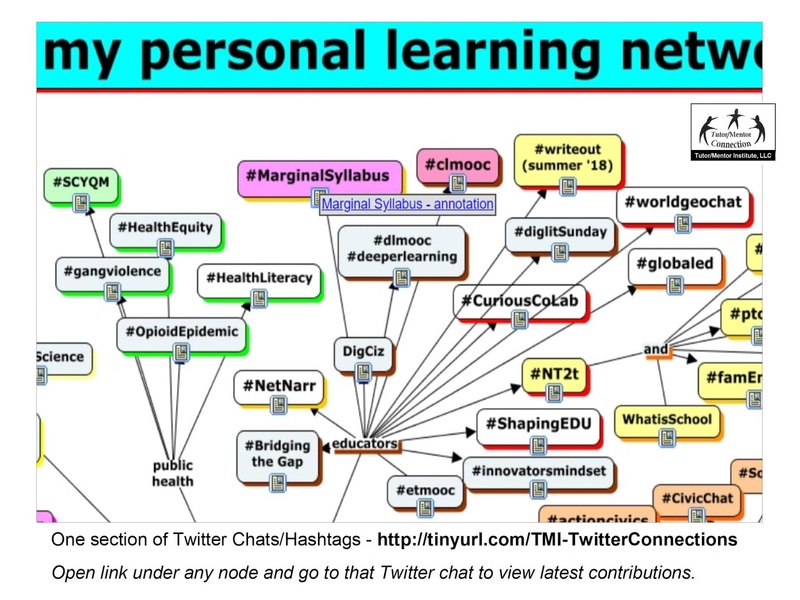 This graphic shows a section of a Twitter hashtag map that I created to help me archive conversations like Equity Unbound so I could re-visit them on a regular basis and see what new information has been added. 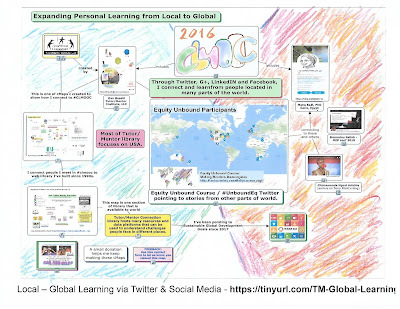 If you look at the full map, it shows a large range of conversations, which to me represents the ecosystem of people who need to be connected, engaged and learning from each other. 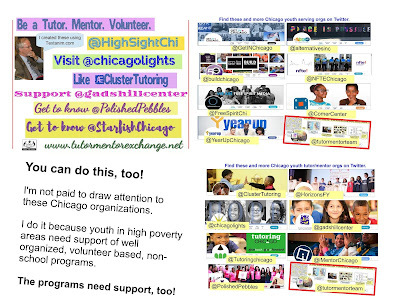 One frustration is that while I find Twitter the easiest place to connect with others and find new ideas, I only find a small percent of the Chicago youth tutor/mentor programs on my list actively using Twitter. Thus, they are missing out on this opportunity to learn from others, and each other. 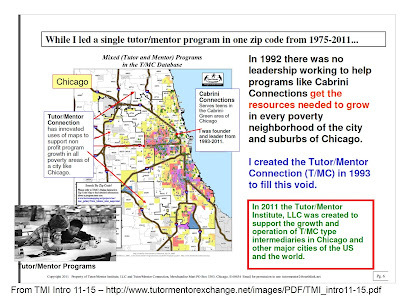 Here's a graphic I created a long time ago to show the local-global focus of the Tutor/Mentor Connection and the site based Cabrini Connections tutor/mentor program, which were both launched in early 1993. 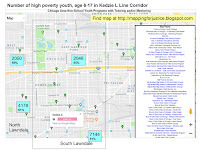 When we started Cabrini Connections with seven volunteers and five teens in late 1992 we said "one more small program can be life-changing for a few youth, but won't dent the problems of high poverty facing the 200,000-plus youth living in poverty areas of Chicago. That's why we created the Tutor/Mentor Connection, and why I still lead it via the Tutor/Mentor Institute, LLC. I've shared stories with graphics like these over and over for more than 20 years. In my 1973-1990 retail advertising career working for the headquarters of the Montgomery Ward corporation in Chicago I worked to help more than 400 stores in 40 states attract customers every week. 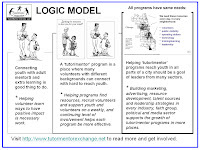 I can't understand why it is so difficult for people to apply the same thinking to try to support the growth of hundreds of volunteer-based tutor, mentor and learning programs in high poverty neighborhoods of Chicago and other cities. Well, I can. Competition for resources is one reason. The rules and traditions of philanthropy and government funding are another. However, it would seem that more people would look at the maps and articles I've been sharing and say "I want to help you do this. Or, I want you to help me do this." 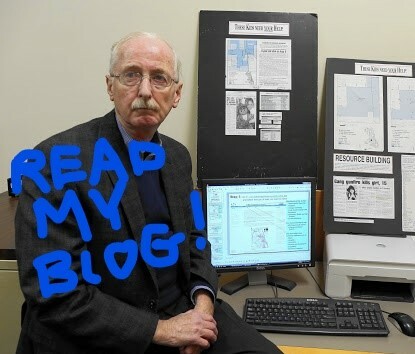 Here are a couple of graphics where I've added a "read my blog" message. I've shared these on other media, including Instagram, in an effort to attract more people to these stories. Will it work? Worth a try. All of these stories are intended to motivate more people to do the learning needed to better understand problems and possible solutions, and to encourage them to connect with each other in on-going efforts to fill map areas with a wide range of youth, family and jobs support....including volunteer-based tutor/mentor programs. If this is something you value, can you help me with a contribution to my FUND ME campaign? 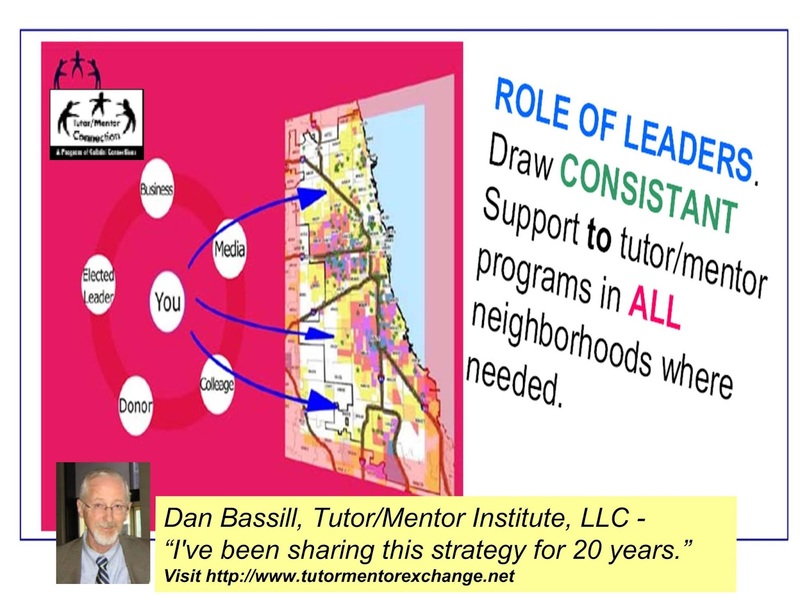 Students, volunteers and interns have created videos showing Tutor/Mentor Connection/Institute, LLC strategies since late 1990s. I started creating a few videos myself, in late 2000s. I've added a few more in the past year. While you can search YouTube for these, I created a few pages where you could more easily find and view these. Below is the first page of the collection. I realize that the page layout is really crude, but it's the best I can do with the talent and dollars I have. Thus, I invite others to create and share their own versions of these, or volunteer your talent to create a new template for sharing these videos. These and all of the articles on this blog focus on one big question that required on-going involvement of many people to find and implement answers. What will it take to assure that all youth born or living in high poverty today are entering careers by age 25 or 30? I look forward to connecting with you on one of these social media platforms. 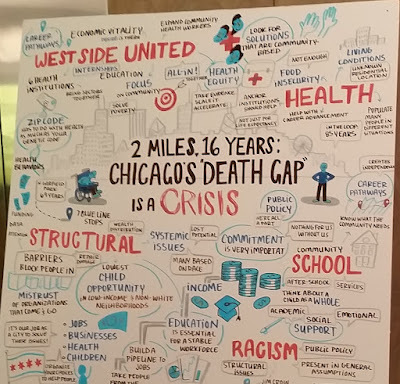 Yesterday I attended one of the Chicago Ideas Week events, titled "2 Miles, 16 Years: Chicago's Death Gap is a Crisis". Below is a Twitter post that shows the map shared at the start of the panel discussion, to show how where you live makes a huge difference in how long, and how well, you live. This is a map showing far Chicago's West side neighborhoods. As I listened to the presentation I said to myself, with considerable frustration, "they are preaching to the choir" and "why have I not been able to get into these conversations at the planning stage?" 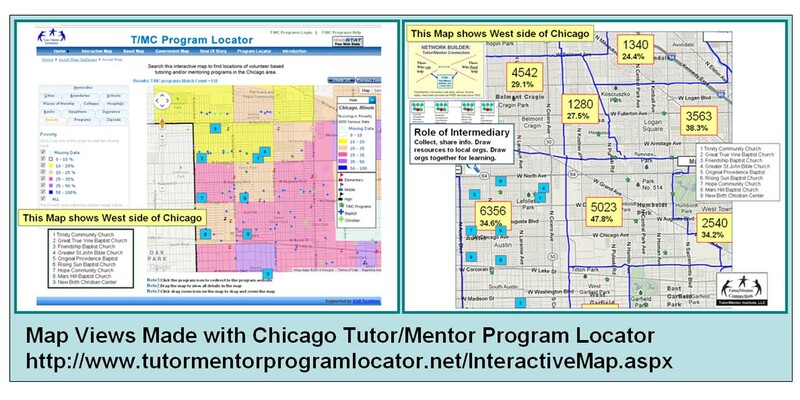 This map shows non-school tutor and/or mentor programs on the West side. 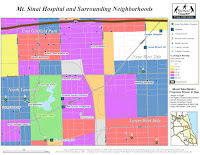 It's part of this article, where I point to roles hospitals and universities could be taking to help give kids greater hope and opportunity, by helping well organized, long-term, volunteer-based tutor, mentor and learning programs reach k-12 youth throughout the map area. Here's an article I wrote in 2008, focusing on roles that Mt. 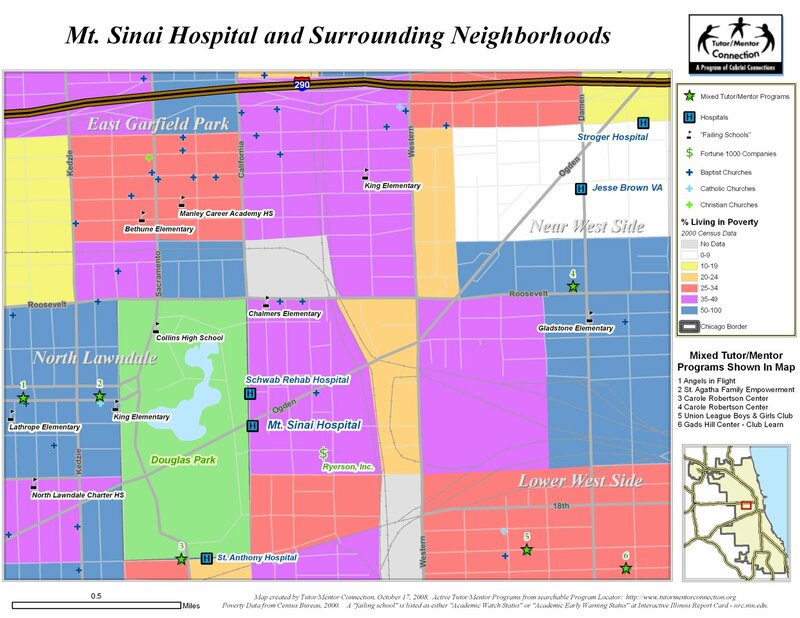 Sinai Hospital could be taking to help youth tutor/mentor programs grow in the area served by the hospital. I've had conversations with various staff from Mt. Sinai since the late 1990s, but never have been able to forge anything strategic that would have helped them implement the strategies I've been sharing. 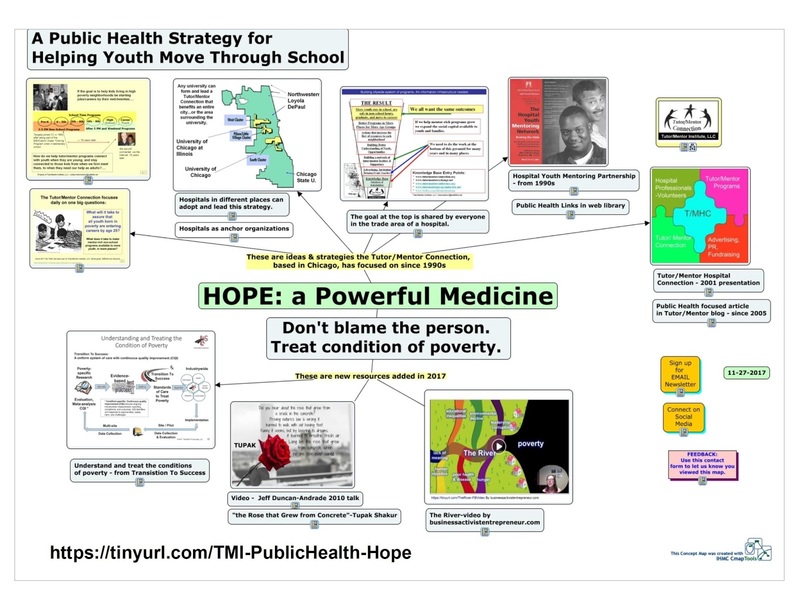 Below is a concept map that I created in December 2017, to point to various public health networks and resources that I've been pointing to since late 1990s. One of these is the Hospital Youth Mentoring Network, that operated from the late 1980s until the early 2000s. 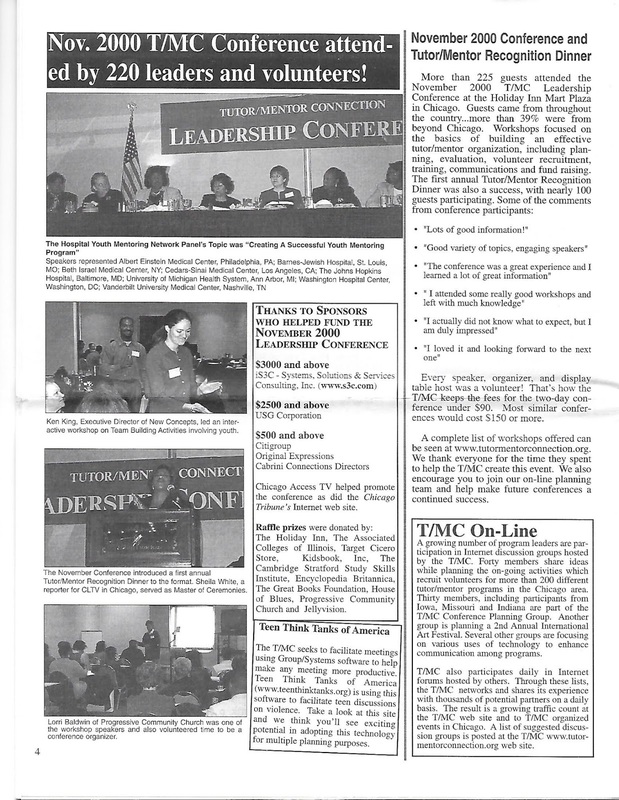 In this Feb/March 2001 Tutor/Mentor Connection newsletter you can see a photo at the top of the page, showing how members of the Hospital Youth Mentoring Network participated in one of the Tutor/Mentor Leadership and Networking Conferences that I held in Chicago from May 1994 to May 2015. 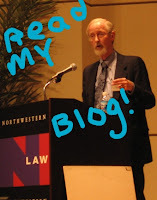 Prior to starting this blog in 2005, I used email newsletters, and web sites, to share ideas and strategies. 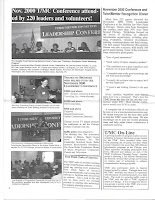 Prior to that I was able to send a printed newsletter to about 12,000 people three times a year, from 1996 to 2002. When funding ran out I had to discontinue this. Finally, here's a map story from 1997. 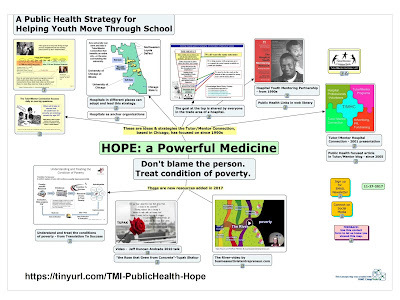 This shows all of the strategies I've been trying to incorporate into our map stories for more than 20 years. It follows a feature story in the Chicago Tribune. Thus, reader attention had already been built. We just needed to tell "the rest of the story." 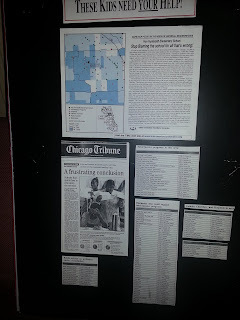 Using donated ESRI software we were able to create a map showing the location of the school featured in the news article, which was located on Chicago's West side. In that map we showed indicators, such as poverty, which contribute to failing schools. We wrote a story to go with the map. 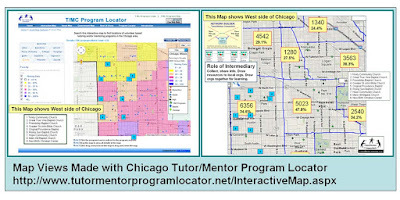 We built a list of youth tutor and/or mentor programs located in the area. We also built a list of assets, businesses, hospitals, faith groups, colleges, etc. who could be helping youth tutor/mentor programs grow in the area. 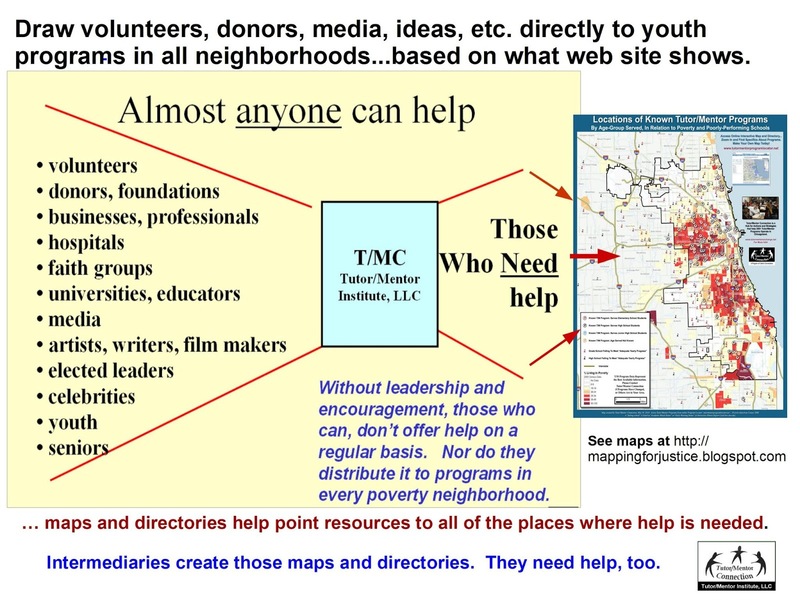 In 2008 I received a generous donation of $50,000 which we used to rebuild out desk top mapping capacity, then to build an interactive map directory that people could use to create their own map stories. In this wiki page you can see what this was intended to do. Unfortunately, we had almost no money to share these map stories or to keep updating the Program Locator. We put some in our printed newsletters, but the reach was limited. The Program Locator has not been working properly since 2013. 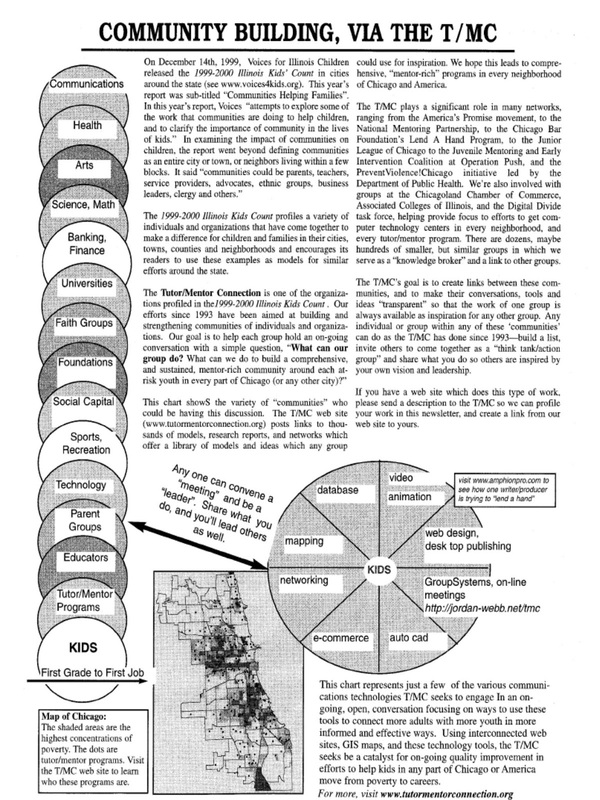 Yet, this is still the strategy I've been following for 25 years and which I share with the goal that students in high schools and colleges, and in existing youth programs, will duplicate my efforts and create map stories focusing on their own neighborhoods or adopted sections of the city. 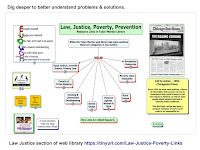 Open tabs for media, maps, violence and public health on this blog, and then browse articles on this blog, and on the MappingforJustice blog to find many examples of this strategy in action. Almost every week there is a group of people meeting some place in Chicago, or in other cities, to talk about poverty, violence, inequality, etc. Last week it was the Chicago To & Through Project annual meeting, held in Chicago. I can only attend a small number of these, and even if I'm in the room I'm barely able to have a conversation with the one or two people sitting next to me. Are participants sharing info from events? The only way to connect such a large ecosystem of people and ideas is through the Internet and platforms like Twitter, Facebook or Linkedin. Yet, if organizers of these events created a network analysis map of their events to see who is engaging on one of these platforms, they'd find that it's only a very small percent of the total. Among all of the other challenges, this is one more that needs to be addressed. Here's one more. I'm starved for money pay my bills and keep writing this blog and hosting my library on line. If you value what I'm writing about you can help me in three ways. I'm not a professional video producer but with help of volunteers and interns and emerging technologies I've created a library of videos that share ideas from my 35 years of leading a single tutor/mentor program in Chicago, and helping similar programs grow in all high poverty areas of the city. Here's one. 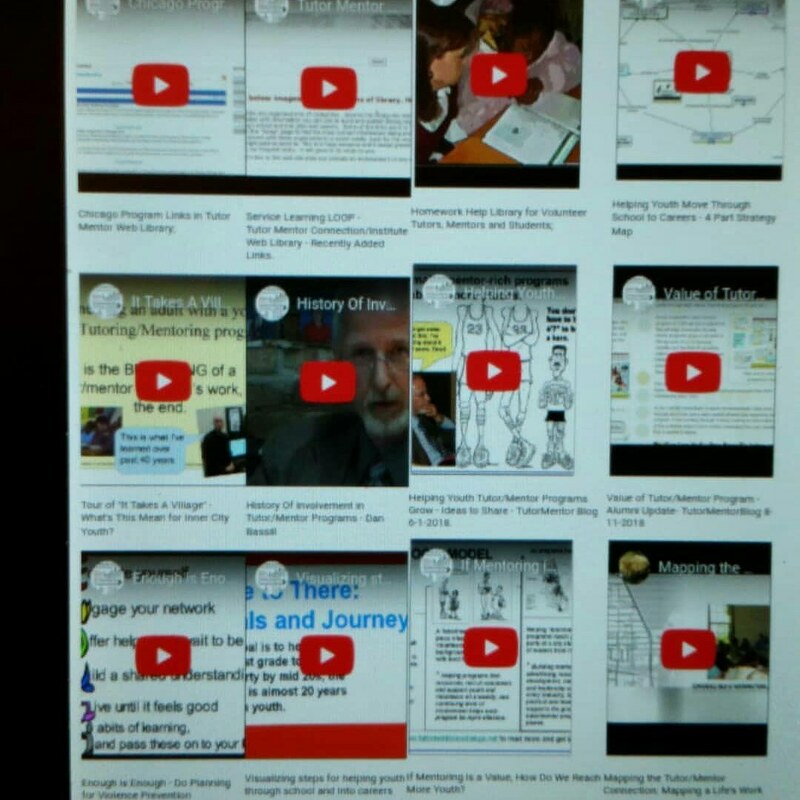 I created this Tutor/Mentor Videos page several years ago to show the full collection of videos that I and interns have created since early 2000s. As you look at my videos and the layout of the collection I'm sure many will say "I can do that better". I invite others to create their own versions, just as interns working with me have done. I invite people to offer their time and talent to rebuild the video theater page. And I invite people to send dollars to my FUNDME page to help me keep doing this work. If you'd like to have your name/logo put on my web sites, pdf presentations and videos, become a sponsor/partner. Let's talk. I'm going to share some graphics in this article. At the end, if you believe in what I do, I hope you'll help me. The kids shown at the left, and the adult, were part of the Cabrini Connections program I started in 1993 and led until mid 2011. The kids were in 7th and 8th grade at the time this picture was taken in 1994 or 1995. The adult is Claucia Crilly Bellucci, who started as a volunteer in the 1980s and became one of the first paid staff members of Cabrini Connections in the fall of 1993. At the right I'm shown with one of the kids in the photo on the left, when she came back in the late 2000s, after college, to speak at our year-end dinner. I'm connected to her, Claudia and many of these kids on Facebook. I'm still connected to the boy I was first matched with in 1973! He's on Facebook, too. Long-term relationships and support systems. That's the goal. 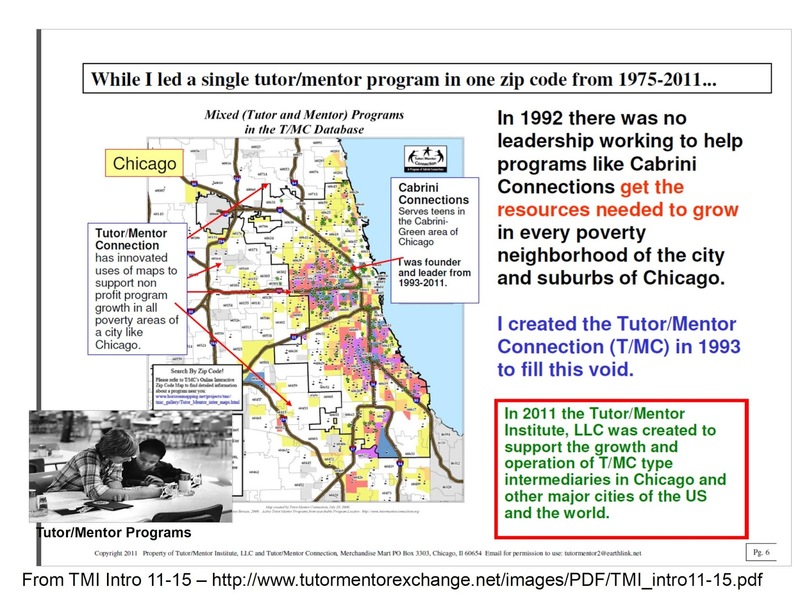 My experiences leading a single tutor/mentor program, starting in 1975, led me to a belief that these programs are a form of social capital, connecting inner city kids with people, experiences and opportunities beyond what is modeled in their neighborhoods. Such programs need to be in many places, led by highly motivated people, and consistently funded, if they are to build and sustain long-term involvement of youth and volunteers. The school day has three time frames. Kids need support in each of these time frames. The third time frame, in the early evening hours, right after work, is when workplace volunteers are more consistently available and able to make long-term commitments. That leads me to this next graphic. I've posted a number of sports-themed articles showing that it takes a team of fans, investors, coaches, players, trainers, sports companies, etc. 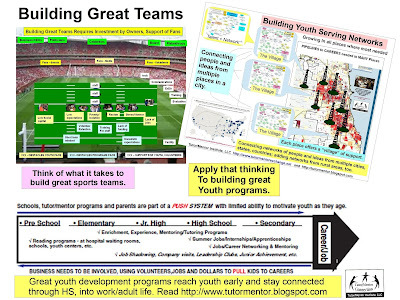 to build and sustain great football, baseball, basketball and/or soccer teams. It takes the same range of support to help each tutor/mentor program in the city become great at what they do. The graphic at the right illustrates the football team. 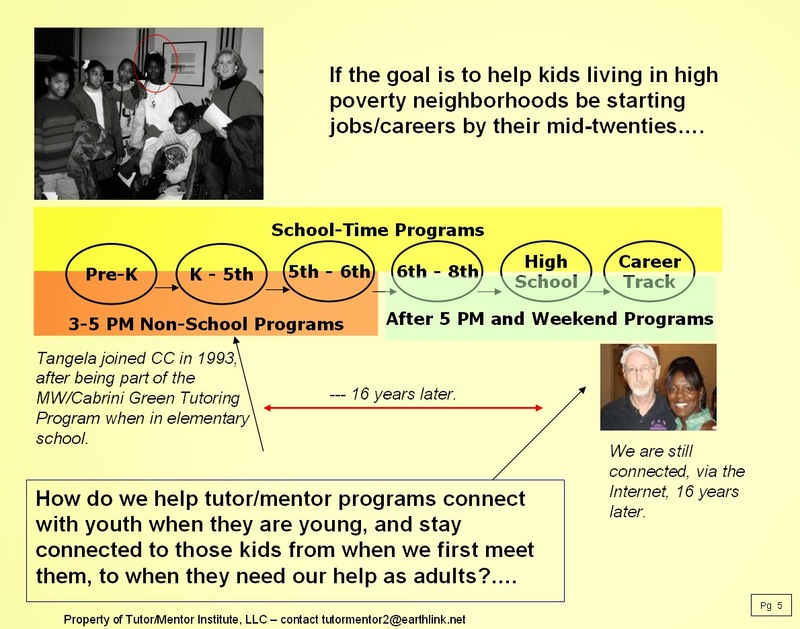 The graphic at the right illustrates the need for teams of support helping great tutor/mentor programs reach kids in every high poverty neighborhood, with support that starts early and continues through high school, college or vocational school, or the military, and into jobs and careers. Below these two graphics is a first grade to first job timeline, showing some of the age appropriate supports kids need at each age level as they grow up. The concept map at the right shows these supports in a different format. Actually the support that kids and families need is far greater than what I show on this map. 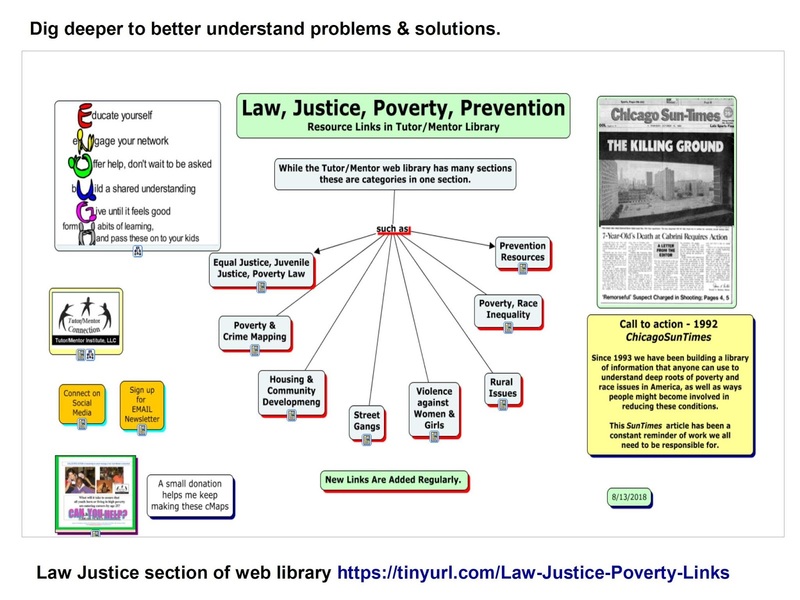 Open this concept map and see many other issues that need to be addressed in every high poverty neighborhood of Chicago and other cities. Now look at this "iceberg" graphic. I wrote about it here. The part above the water is what you see when you look at a photo of a youth and volunteer connecting at a tutor/mentor program, or in an enrichment outing. What you don't see is what's below the water line. This is the program infrastructure that helps great programs become great. It's the same infrastructure that helps great sports teams become great, or that helps great businesses grow. I used the word "great" five times in that paragraph. That's because I keep emphasizing the need for well-organized, well-funded, long-term, mentor-rich programs in every high poverty neighborhood of Chicago, it's suburbs, and other cities around the country....and in rural areas and on reservations, too! They all need to be great, or at least trying to be great! So here's the logic model that I'm talking about. If you believe that connecting kids with extra adults and expanded learning opportunities is a good thing, then you need to accept that well-organized youth tutor, mentor and learning programs are going to be needed to help those connections begin, and last, for many years. If you accept this as truth, and look at a map of Chicago, and the number of high poverty youth in the city alone (over 200,000), then you need to accept that many great programs are needed, and they are needed in every high poverty community area. Many leaders need to share this commitment. 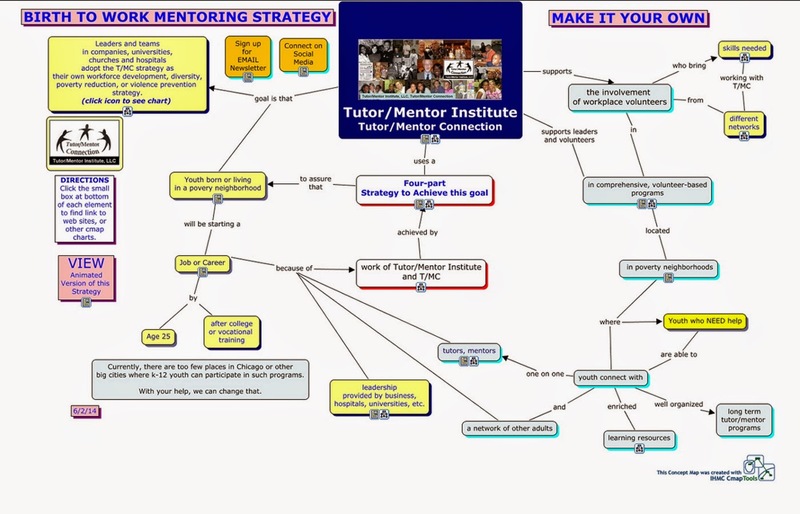 If you are willing to work to help build the infrastructure needed to make great tutor/mentor programs available throughout the city, spend time looking through this concept map. Then create a version, putting your photo and/or company logo, in the blue box, and put it on your web site or blog, signalling your commitment to the goals and the strategy. I've been sharing this message, along with a library or resources, and list of existing programs operating in Chicago, since 1994. Yet, I find almost no leaders using a collection of graphics similar to those I've put into this article, to share their own commitment to this same goal. 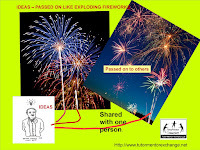 I launch my ideas on blog articles every week, then spread them, like fireworks via social media. As you and others pass them on in your own feeds, we reach more people, and maybe convince some to take on leadership roles in this effort. Such leaders can be from any city in the USA, or from other parts of the world! I encourage you to read more of my past blog articles. 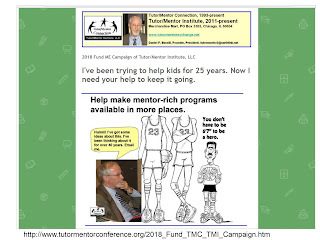 Or browse sections of the Tutor/Mentor Institute, LLC web site to build a deeper understanding, and commitment to what I'm writing about. Subscribe to monthly e-mail newsletter - see example. Click here to sign up. Thank you for reading this entire article. For me to continue to do this I need your financial support. Visit my FUNDME page and send a small, or large, contribution. In many places school is out and people are celebrating the Columbus Day Holiday. However, in a growing number of other places, the name of this holiday has been changed to Indigenous Peoples Day, to recognize that America was already full of people with a rich civilization before settlers from Europe invaded the continent and took their land. Here are some hashtags you can use to find more Tweets and links. #indigenouspeoplesday, #IndigenousPeoplesDay2018 You can do a Google search and find many articles and resources. Here's a site with many links embedded. I've been working with inner-city youth in Chicago since 1975. Since most of those in the programs I've led were African American and Latino youth my web library has tended to include many more articles that show how actions taken from the 1600's through today have created the racial barriers and cultural divide we're struggling with in this country. 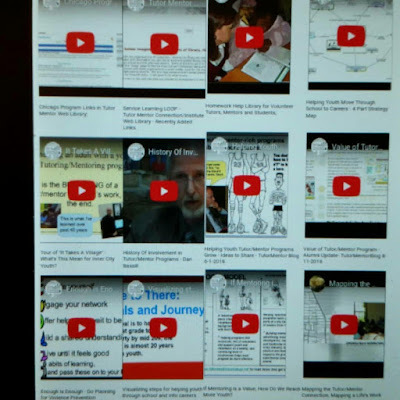 The cMap at the left points to one sub-section of the Tutor/Mentor web library. This section includes articles about race, poverty, inequality, social justice, prevention, etc. that are available to anyone who wants to build a deeper understanding of these issues. If someone is building a similar library, focusing on other US cities or the rest of the world, or focusing on Indigenous Peoples or Latino, Asian and other minority groups who have been discriminated against by the majority in America, send me links and I'll add them to my own library. Note: I depend on contributions to help fund my work. Please visit my FundMe page and help if you can. 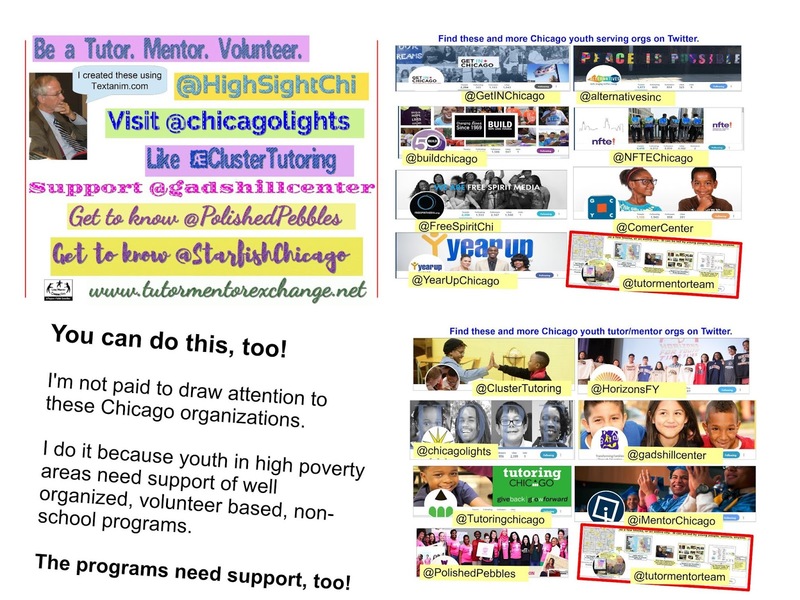 Below is a graphic I created to show ways I've been trying to draw attention to youth tutor and/or mentoring programs operating in the Chicago region. Browse this list of Chicago programs. Create your own graphics. This is actually a montage of three different graphics that I shared on Twitter and Facebook several times over the past year. 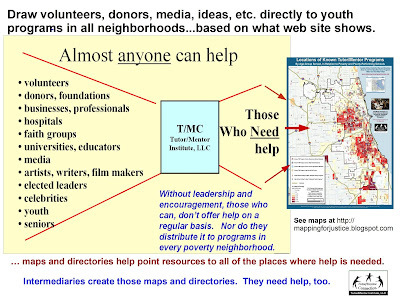 Below is another graphic, visualizing my role as an intermediary, connecting people who can help with tutor/mentor programs in places where extra help is needed. The list of "who can help" includes almost everyone. With so much daily attention focused on national and local politics, international issues, natural disasters, along with sports and entertainment, it's important to keep in mind that kids take 20 to 25 years to grow from birth to work, which they do one day at a time! That means that programs giving these kids extra support need to be in place in every high poverty neighborhood and they need consistent support from volunteers, donors and the public, to sustain and constantly improve their efforts. This photo visualizes my efforts since 1975 to get people involved in youth tutor/mentor programs, and to get people to talk to each other about ways we can make great programs available to youth in more places, and what "great" really means. If you look at the list of tags on the left side of this blog, imagine each as a topic of an on-going conversation involving people from many sectors, many places, and many cities. I just don't see enough of this happening, with maps and concept maps serving as guides to where programs are most needed and what program designs and support systems need to look like. You're welcome to use my articles as thought starters in any conversation. You're welcome to create your own versions of my graphics. You're encouraged to duplicate my efforts, to help kids in the Chicago region, or kids in other places. Finally, you're invited to provide small (or large) contributions to help FUND ME so I can continue to do this work, and do it better. That means you're also invited to become a partner and not only help me, but build your own knowledge so you can take on this role in future years, and /or in other places. 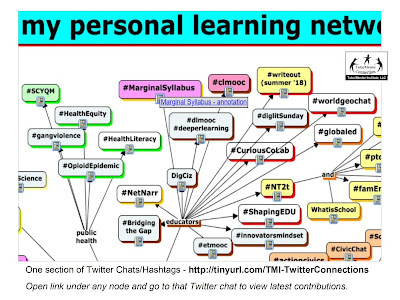 If you're doing this work on a daily basis, as I am, or want to learn how, let's connect on Twitter, Facebook and/or LinkedIN.